Questions can make or break a negotiation — and yet they’re undervalued and overlooked by most negotiators. Do we think about our questions ahead of time? Are they carefully crafted to produce useful answers? In my experience, most negotiators just wing it. They don’t understand the value of good questions, ask good questions, or know how to listen to the answers. As a result, they don’t accomplish what they can and should. The good news is that you will already be better with your questions 10 minutes from now, when you have finished this article. Take to heart the principles I lay out here, work with them, practice, use the results in your negotiations, and you will see a dramatic difference in your outcomes. “Isn’t it true, Mr. Smithers, that you bought a Smith & Wesson in June 2011? The point of these questions is to intimidate, to throw the witness on the defensive and hope for a Perry Mason-style breakdown and confession right on the stand. But the kind of forceful, leading question that works on TV crime shows and that some salespeople have been trained to use is, in fact, the worst possible question. This is the worst of all the worst questions. By driving the customer to a “yes” answer, you’re trying to close the deal and collect the cash. But all you’ll do is blow the deal. What do you do when asked such a question? You wince. You look for the trick. Put yourself in their shoes. Never ask a question that you would not welcome hearing yourself. And not because you’re such a great gal or guy. Because you want deals and agreements, and intimidating the other side with trick-sounding questions is not the way to get them. But inexperienced negotiators ask these questions or the equivalent all the time. You can blow a solid one-hour presentation in 10 seconds with a single ill-chosen question. So where does Socrates come into this? The Socratic method is nothing more or less than using good questions to drive vision and discovery in others. This is how Socrates proceeded with his pupils: asking an easy, open question; using the answer to frame another easy, open question; and before the other guy knew what was happening, his argument was in trouble, and he knew it. But here’s the key. The other guy wasn’t angry. He had not been intimidated. He had arrived at his new conclusions apparently on his own. As a negotiator, you want to use your very own Socratic method to ask good questions that will drive the vision of the other side to see the value of what you bring to the table. No vision, no good decisions; no good decisions, no deals that stick. You could be selling a mint Mercedes for $10,000, but if for any reason the other side doesn’t have a vision of this value, you won’t make the sale. You do not demand that they see that value, for the simple reason that it won’t work. You do not beg them to see that value. That won’t work, either, because they’ll interpret your weakness as a sign that there’s something wrong here, and they’ll be correct. Instead, in the manner of Socrates you invite them to see that value for themselves, and the way you do this is with questions. What’s the difference between a question that will build vision and a bad question that will kill vision? There are two types of questions, verb-led questions and interrogative-led questions, and you want to use the latter. Will you have authority to do this? Do you have five minutes to see me? None of those questions stand a very good chance of building vision in the other party of why they’re negotiating and of the value you bring to the table. So what are the best questions that build vision? The answer is: questions that are led by interrogatives. Who, what, when, where, why, how, and sometimes which. We use interrogatives to turn on the discovery channel in listeners and negotiators. By using interrogatives, we gain entrance into what the folks on the other side are seeing in this negotiation. The interrogative-led questions will paint vision that will move the negotiation forward without the pitfalls of verb-led questions. They don’t challenge the other party. They don’t put the other person on the defensive. They elicit information and build vision. You have to be diligent and careful with all questions — with every word you utter — but the verb-led questions are almost all downside, while interrogative-led questions are a key means of discovery. Consider the following set of verb-led questions juxtaposed with a corresponding set of interrogative-led questions. In every case, which is better? Open-ended, completely nonthreatening questions are the ones that have the best chance of keeping everyone relaxed, of opening the doors, of building vision. Of course, you can’t just robotically rely on the rule about interrogative-led questions and believe that all your worries are over. The specific words you use are all-important. “How much did you invest in this piece of junk?” Not a good question — and you know it. Let’s try a substitute for the loaded phrase. “How much did you invest in this technology?” Much better — depending on how you say the word technology. Say it a certain way and it’s innocuous. Say it another way — sarcastically — and the “piece of junk” implication hangs in the air. So use your head, please. At the negotiating table, exercise some discipline and nurture. That’s right, nurture. You can ask the exact same question with a nurturing tone, maybe even with some nurturing words. If building vision on the other side requires that they see what you have already seen, that their $3 million software really is useless, you’re going to have to soften the blow as you ask the questions that build that vision. You cannot hit them over the head with the truth. They’ll go defensive and blame the messenger — you. “No, Pete, I don’t mind hearing that. I want you to tell me what’s wrong. “I know you’re the team leader, Franklin. Do we have everyone onboard? Quite simply, almost all of us prefer talking with and dealing with nurturers, people who make us comfortable. Alas, most of us are not naturally gifted in this regard. I know I’m not. I’ve had to spend my coaching career getting better, and I am getting better. So can you. Asking good questions is not rocket science. Generally speaking, the negotiator who asks interrogative-led questions in a nurturing way is on the right track and will have better success negotiating. Socrates did it and so can you. It’s a simple fact: You are negotiating, or being negotiated with, all the time. If you’re not actively participating in that process — or if you’re using the old, ineffective guidelines and strategies we were all raised with — then you’re NOT getting all you can and should get. 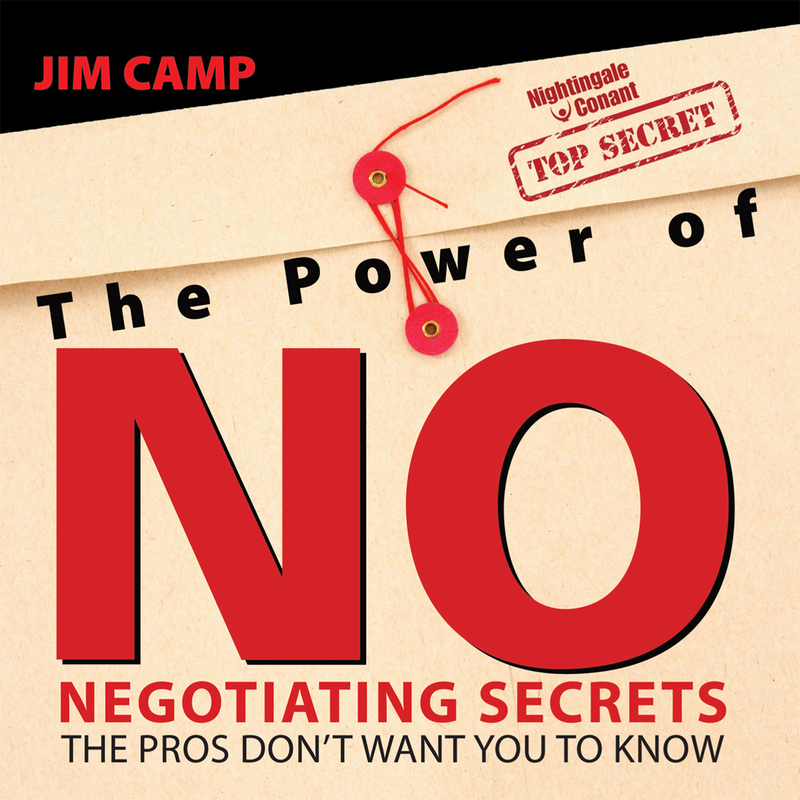 In	The Power of NO: Negotiating Secrets the Pros Don't Want You to Know, world-renowned negotiation coach Jim Camp gives you his proven step-by-step system for structured, comfortable, compromise-free negotiation that will empower you to successfully get everything you want in every agreement you make. The product of 25 years of research, development, and testing, this system based on solid, proven neuroscientific information about how the human mind reacts, processes information, and makes decisions. The six words to say — at the very start of a negotiation — that will instantly shift the power balance in YOUR favor. Imagine walking into your next negotiation knowing exactly what’s going to happen, from the moment you sit down until the moment you walk out the door. Imagine feeling 100% comfortable and totally fearless throughout the entire process. Imagine never having to resort to a fallback position, concede anything, or compromise on any of what you want. This is what negotiating should be like. What it IS like for the more than 100,000 people Jim Camp has coached and trained — who have collectively negotiated tens of billions of dollars in results using this very system. Now it’s what negotiating can be like for YOU, once you master The Power of NO. Fearlessly ask for what you want and easily get it in any negotiation. The Power of NO at the special price below. — I can select one of two ways of ordering.